I'll start - My name is John Heard, I'm the guy that runs this site. I've got a wonderful wife and two kids, Justin who will be 16 soon (watch out). and Savannah who is going to school at K-State. I race a 1971 Nova in MAKO Real Street Class, that's a organization that runs in Oklahoma and Missouri right now, first year for it. My Nova is still apart from all the changes I made to it over the winter. I'm right in the middle of rebuilding the big block in it. Here's a picture a friend took last summer.. I'm Greg Carlsen from Spokane, WA. I'm still in my first year of marriage and almost a full year into our new house. As such, my poor car has taken a back seat. It is a 67 RS/SS sporting a nasty black primer and looks... well... like a primer black camaro. :p Runs a 540 BBC w/a wee bit of nitrous through a glide and out to a dana 60. I drive it around for fun and take it out to the track occasionaly. Best time so far is 8.917. Then end of last year we finally started to get the thing to 60', so hopefully after it gets going this year, it will see some 8.80s with it's current tune. Then we'll go either bigger jets or throw some fogger nozzles in the carb spacer. Hi everyone, I'm Craig Watson from Columbia, Kentucky. I'm a 31 year old Mechanical Engineer working in the pump industry. I've been married 10 years and have one son, Timothy, who will be 8 next month. 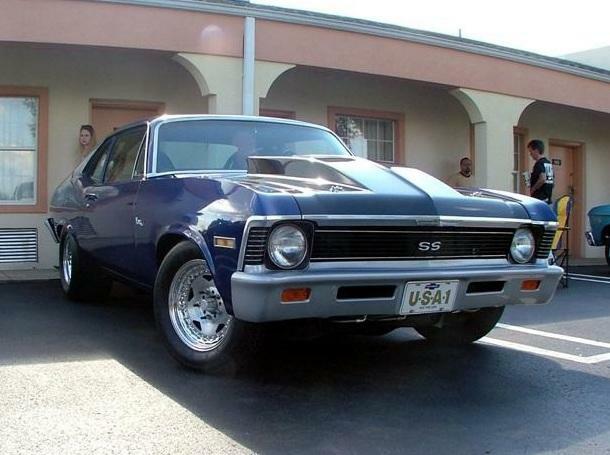 I've had my '73 Nova since I was 17 and its progressed from daily driver to mostly heads-up race car with some street miles thrown in for good measure. I race with the Ohio Valley Outlaw Street Car series in Louisville as well as OSCA in KY/IN/OH in Outlaw 8.5/Mild Street. Basically the only real rules are minimum weight an 26x8.5" max tire. I'm in the middle of building a new motor that'll hopefully let me run at the front of the class (5.79 is the record right now). Last year's best pass was 6.48@106 on a 125 shot, but it wasn't setup to work with nitrous (6000 stall 8" converter, 5.13 gears, etc). The new combo is focusing on nitrous use, but I think it can still run high 9s on the motor if all goes as planned. 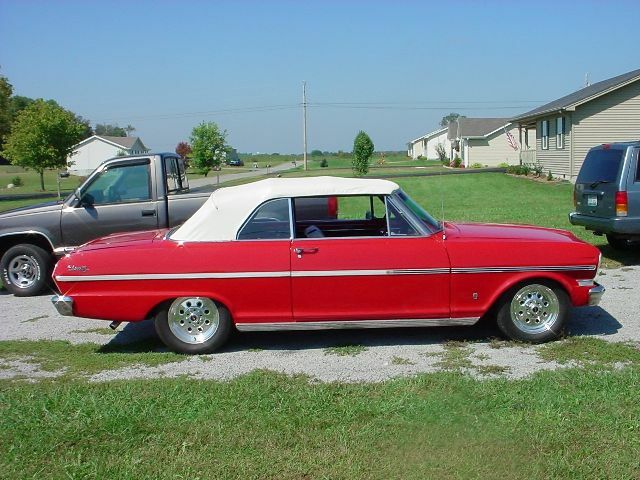 My wife has a '63 Chevy II convertible that we take to cruises and for Sunday drives. Love that little car. We've had it since '00 and I've had 4 motors in it already. I just can't leave well enough alone! I've got plans for a new 406 for it this winter. My Dad and I are restifying his '57 Chevy Bel-Air and we're just about ready to fire it for the first time. Can't wait to get that car done and see Mom and Dad out enjoying it. 4.5 years in the making, but it should be nice when we're done with it. No bolt left unturned. Whose blue car is that in the background? Jim McCallum and myself teamed up about 6 years ago and are running a 63 Vette Pro Mod. It has a one of a kind pulsed nitrous system that I helped desigh and develope.We have yet to log any great et's for Pro Mod but we have had alot of engine sealing issues.No excuses just fact, I call em how I see um..I think John will back me up on that one. I have been playing with the funny gas alot of years and have run with some of the fastest Pro Mod nitrous guys for years.. maybe you have heard of Tommy The Undertaker Gray .. close friends for 15 years and while I was in the street ranks I helped him with his Pro Mod. Well I hope i can be of some help. Hi guy's. I'm 38. I've been married 13 years and have 2 girls, Ashlei, 7 and Kelsi, 2. I've been racing since '86 and doing the heads up street car stuff since '90. In '92 I managed to get into the top 10 at the first Hot Rod Magazine's Fastest Street Car Shootout. I've been building cars since 1989. Specializing in 10.5 tire cars chassis, suspension, and components. 67-69 Camaro, 68-74 Nova Tubular A-arms. 62-67 Chevy II tubular A-arms. Last edited by novaz on Fri May 20, 2005 6:36 pm, edited 1 time in total. I'm Chuck Butcher, 52 yrs, married for 15 yrs, a son & a stepson. I race my '62 ChevyII NHRA Div 6 Pro-bracket. Sealevel corrected it's a 12.75 daily driver on DOTs, full interior, full exhaust, IROC strut front-end, 3.42 posi. Don't force that, son, use a bigger hammer. Hi, my name is Todd Geisler and live in Maryland. 35 years old, married 13 years, have two girls (one 2 yrs, other 5 yrs old). I'm currently a Mr. Mom till the girls are both in school. I race a '79 Malibu stock suspension street/strip type car. it has a mild high compression 454, th400, 12 bolt w/4.10 gears and 275/60-15 M/T drag radial DOT tires. The car also has a full street exhaust out the back including tail pipes. The car is raced normally aspirated, foobraked and runs 10.20's @ 129 mph with a best 60' of 1.415 to date...still tuning the new engine combination. Here's a shot from last season at Cecil County dragway taken by Matt & Mark at www.godragracing.com. I have raced with the MSRA (Maryland Street Racing Assoc) in their DOT class for 3 or 4 years now...nice day one of the org basically. I'm also gonna run a second organization this season which is Rich Maitre's RAM Racing normally aspirated shootout in the drag radial class. DOTracer wrote: Hi, my name is Todd Geisler and live in Maryland. The car still looks great Todd. I remember reading about your car on the web 7-8 years ago and wishing my Nova could be that fast. I see you're another all-motor guy. My heart is all-motor, but I've had to start "cheating" to keep up since I race in an anything-goes class. Hopefully I won't have to spray too much nitrous to compete for wins this year. Good to have you on the board. Later. Thanks for thw warm welcome Craig. Yea, I've had this thing for a while now and if you work on em and beat them long enough, they finally start to come around and run decent . Yea, I have always been a N/A guy just because I have zero experience with nitrous, etc. I do race against a bunch of guys that run nitrous and I'm as close as ever to putting a system on. The DOT class is a 10.0 index and I'm still not very competetive in the 10.20-30 range. I'm gonna keep tweaking more this season and see how much I can gain in just N/A tuneup before putting a small kit on for two or three tenths. I'm really looking forward to seeing how this RAM Racing deal goes in drag radial. Will be nice racing against all motor guys and not worring about some guy squirting his kit to put a fender out on you. I ran most of last year all-motor and finally had enough of losing first round. I had more motor than pretty much anyone else in the class, but they were shooting 300+hp on top of their 500-550 hp motors. Hard to compete with that with a little over 600 hp. So I started playing with the nitrous late in the season. My new motor will be as strong as last year's setup on nitrous, plus I'm building to allow a 400 shot. The 26x8.5" slicks that I have to run won't like that too much, so I'm only going to spray as much as I have to in order to get the job done. Good luck this year. Sounds like some neat classes you run in. A few lobbied to get Outlaw 8.5 put on a 6.0 index, but that didn't happen. Now the class record is 5.78 and undoubtedly will drop even lower before the year is over. Whoa! Now that's one gorgeous motor. Makes mine look like crap! im kevin, live southern california. no kids or wife, just cars and toys. have put together a few motors for freinds cars and help out with my brothers stockers. im currently putting together a 82 camaro to run in the pacific street car association, probably the hot street class which is all motor. currently tuning a couple cars that are running brackets there. heres my buddies car that i build the engine and trans for, still working on dialing it in. the other freind im helping out, hes just getting started in drag racing and we've already picked up over a second with just some minor parts swapping and tuning.